Americans should be happy that Bernie Sanders delivered a near defeat to that manipulative-corporatist Hillary Clinton in the Iowa Caucus. Sanders holds a just position on a variety of liberty issues: drug law reform, women’s rights, climate change, LGBT rights, veteran’s care reform, fighting cronyism and special interests, and he possesses a reluctance to engage in war except when absolutely necessary. Clinton, however, is all over the map on the issues. She is a political opportunist and she only cares about obtaining more power. Sanders, unlike Clinton, is fairly intellectually consistent. Also– like former Presidential Candidate Ron Paul who was also intellectually consistent –Sanders primarily raises money from small individual donors and not giant political PAC’s, wealthy lobbyists, and other esoteric organizations. The latter are the backbone of Clinton’s campaign funding. Sanders is alluring to youth because he is socially liberal, he makes grandiose promises, and he is anti-establishment. But while Sanders is socially liberal, he is no civil libertarian. A civil libertarian basis their socially liberal positions on sound philosophical grounds and not because their emotions led them to such conclusions. While a civil libertarian may not support free market economics, they typically support strong gun rights, federalism, the separation of powers, unadulterated freedom of speech, fundamental due process, the 9th and 10th Amendments– hell the entire Bill of Rights –and election reform. A civil libertarian supports individuality, whereas a social liberal simply supports social ideas contrary to the status-quo (e.g. gay marriage and drug law reform). Social liberalism has little basis in individuality and individual freedom. Sanders does not support term limits, strong gun rights, or federalism. Having established that Sanders is no civil libertarian, he is also unabashedly anti-capitalist and loathes economic liberty. Why $15? What is the purpose of the minimum wage and how should it be calculated? Does it mean a wage which allows a single individual to live on their own or does it mean a wage which allows an individual to live with three roommates and raise a child while driving a brand new car? The entire concept of a minimum wage is riddled with logical holes. If you increase the minimum wage to $15 an hour, prices will eventually just rise to market equilibrium and we will be right back where we started; if not worse off for a variety of reasons. The aforementioned inflationary effects will simply make the entire exercise of raising the minimum wage pointless; if you give everyone $100 tomorrow, no one will be any richer. Minimum wages are ill-thought and ineffective at reducing poverty. You know what intelligent liberals and conservatives agree reduces poverty? Family planning and diminishing the prevalence of single parenthood. Let’s focus on improving that instead of this shoddy socialist concept of labor price controls. If you really support small business, “shop local,” and the Mom and Pop shops, then you cannot be for a higher minimum wage either. The companies most capable of providing a living (whatever that means) minimum wage, are the Wal-Marts and big corporations. 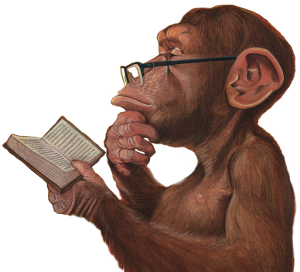 Many of the things liberals support and tout are counterproductive to their end goals. If you higher the minimum wage, you will hurt “shop local” and sharply decrease the availability of jobs for those so desperately in need of work. The wage gap is– by liberal research figures –in the low single digits and not anywhere near the highs that Obama and Sanders claim. It is a non issue. The reason for the small difference is attributed to what is known as the “child penalty” and, yes, a level of sexual discrimination, but the discriminatory impact is very small. The real women’s issue that needs to be addressed is violence against women, not equal pay. In sum, the primary issue with Sanders is that he is a simple social liberal– we need a civil libertarian –and he is a socialist. 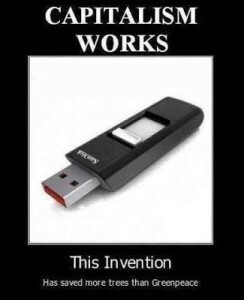 Socialism does not work. Price controls, whether for the price of labor (wages), the price of money (interest rates), or the price of bread, never ever work in a command and control/socialist economy. Socialism doesn’t work because only one thing can determine the appropriate price for a good or service, and that is the millions of consumers and merchants within the market place. There is no great benevolent and omniscient leader(s) who can properly determine the appropriate price for a good or service. Billions of people voting with their money determine this everyday. This is why capitalism is always superior to socialism. 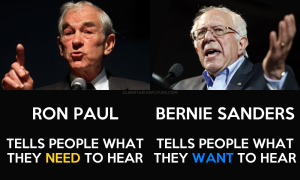 Ron Paul said it best: “…like the philosopher’s stone that could turn lead into gold. 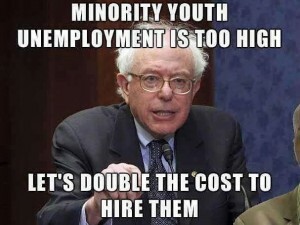 Prosperity without work is a dream of the ages.” Eat his words Sanders. Socialism is a pipe dream and it does not work, nor does it make any logical sense.